Thursday, March 15 | 6pm – 8pm | CRC, 40 Oak St.
Do these claims are any merit? Has the rise in refugees seeking asylum triggered the shelter crisis in Toronto? Does government support for refugees mean less support for poor citizens? Join us to discuss and other important questions at this month’s Speakers Series. The Speakers will make the case for why we should welcome refugees and toss out our rulers. Join us for a meal at 6pm, and stay for the discussion. Maya Menezes is an organizer with No One Is Illegal-Toronto. She works on issues from justice for non-status folks, to environmental protection and poverty reduction. Emily Green is a kitchen relief worker in a shelter for refugee families, a position she has held for almost four years. 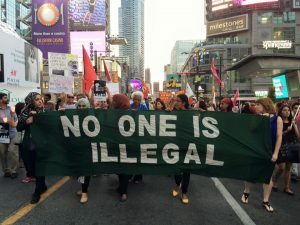 In her front-line work, she has witnessed the crisis in Toronto’s shelters system, as well as some of the other challenges that newcomers to Toronto experience.